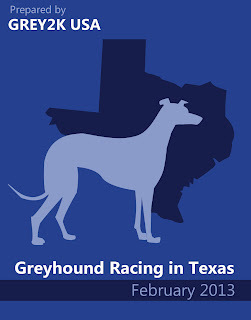 Last week, GREY2K USA President Christine Dorchak traveled to Texas to release a groundbreaking report about dog racing in the Lone Star State. As many as 700 dogs are kept at Gulf Greyhound Park, in small cages that are barely large enough for the dogs to stand up or turn around. Between 2008 and 2011, a total of 1,507 greyhound injuries were reported at Gulf Greyhound Park. The most commonly reported injury was a broken leg, and other reported injuries include puncture wounds, lacerations, paralysis and a fractured skull. Like other states, dog racing is dying in Texas. The total amount gambled on greyhound racing has declined by 61% since 2007, while dog track attendance has fallen by 52%. In recent years Texas greyhound trainers have been cited for animal neglect, cruel live lure training, and dog race drug positives. Greyhounds are fed raw "4-D" meat from diseased animals that has been deemed unfit for human consumption as a way to reduce costs. Six greyhounds died in 2012 at Gulf Greyhound Park from an apparent outbreak of the dog flu. 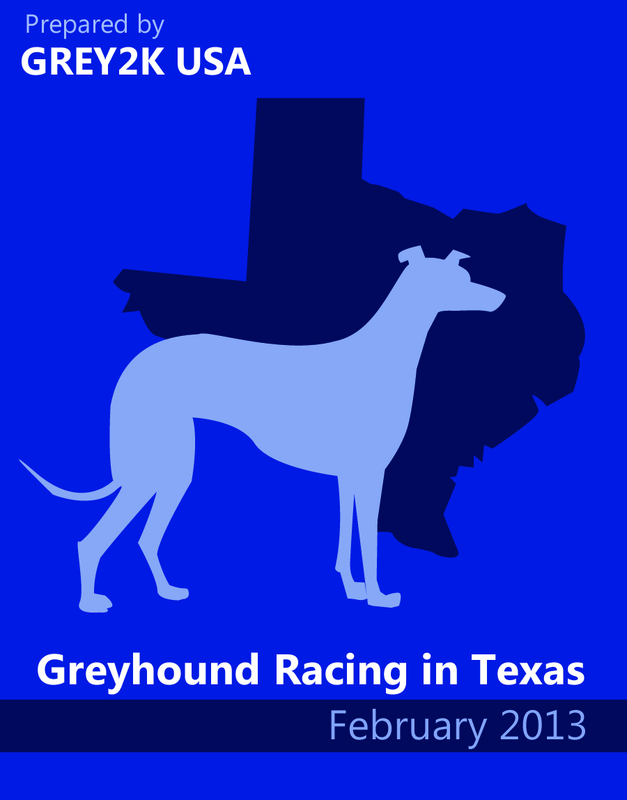 Based on these facts, it's clear that greyhound racing should end in Texas. As difficult as it is to learn about these humane problems, we must turn our grief into action. Already, we are working to defeat legislation that would prop up dog racing with casino gambling profits. Moving forward we will also fight proactively, both by advocating for an end of dog racing and by supporting reforms to make life better for greyhounds. For many years, the Texas Racing Commission has been a leader when it comes to regulating dog racing, and we look forward to working with them to continue improving the state's greyhound welfare rules. Finally, we are extremely grateful to the ASPCA for their leadership and partnership. As the oldest humane organization in the country, they epitomize our American values of compassion and common sense. Together, I know we can make a difference for Texas greyhounds. Just is so sad the way these innocent animals are treated. All of this Greayhound racing abuse needs to be stopped on these beautiful dogs!